Fostering the youth with the passion of. Which leads youth to the final question..
2: KIA HUM EK HAEN ???? A multi sessional event with the motivational & international role model speakers who have created a golden history by workng for the Youth of Pakistan. > Event focuses the common problems & fears of youth that are ignored by the youth itself..Covering sessions on..
10.Increasing evils 0f drug adicti0n. A mini picnic. That will trigger the youth to come out with the fascinating message of unity..
your deeds ..not words ..
& MUCH MUCH MORE !!!! Know yourself & explore your hidden potentials ..
Sponser us with small amount..
^A chance to build your goodwill in society by your actions ..
^Get inspired with top trainers. 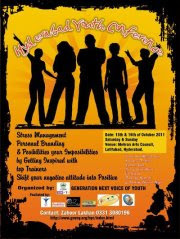 ^get a chance to be a member in GeneraionNext Voice-Of-Youth..